It is the time of year that gardeners’ thoughts turn to garden cleanup. The flower garden may look like this photo (maybe minus the garden Viking that my son bought me). Is this messy, charming, or both? In a Participatory Ecology garden, should you trim the dead, brown stalks or not? Is the garden Viking saying this is too messy? If you do determine that you won’t be trimming now, will your neighbors begin to believe they are living with an eyesore? As with other garden questions, under a more natural gardening paradigm, you have to make plant-by-plant decisions. This sedum is not a native plant, but it is one of the plants that has the most rationales for not trimming; not only is it rather lovely as a dried winter flower in the garden, but it provides both food in the form of seeds for birds and cover for winter critters. Okay, this may not be great if the critters are mice! I think the seed pods on these hybrid hibiscus plants are rather nice looking, and my research shows they also offer up seeds as bird food. Asters are not quite as attractive by human standards, but still dried-flower worthy, and their seeds are also eaten by winter birds. Monarda is even a little more scraggly looking, but still nice, and also provides seeds. Is Joe Pye weed getting to the limit of human aesthetics? I like it, and it definitely provides food. These penstemon stalks still have their seed capsules. Even if the seeds were not eaten by birds, I would leave the stems holding the capsules untrimmed since I count on the plants, one of my favorite garden flowers, to sow any uneaten seed and multiply. This tangle of gaillardia, another favorite flower, still shows a few blooms. These blooms will keep providing pollinator food, while the seeds from spent flowers provide bird food. I imagine these might tiptoe into the human aesthetic of messy. I have other bird seed plants in the garden not pictured here. Mountain mint looks like a plant that provides bird seed, but I haven’t yet confirmed that. Goldenrod is definitely a bird seed plant, although I may bag the flower head so I can save seeds myself and plant in other parts of my gardens. Daisies also provide bird seed. I probably won’t need a bird feeder with all this seed, unless I want to provide things like suet. So, as you may have guessed, I am not planning to trim any of the plants listed above just now, though there are a few plants I do think I will trim. These annual sunflowers, a product of years of development by Native Americans before European incursions as well as years of breeding for beauty since then, have mostly given up their seeds to goldfinches and other birds. They took over one of my vegetable beds before I had a chance to plant it. It’s time for them to go, hopefully pulled with as little soil disruption as possible. This chicory grew from an Insectory seed mix I got as a free bonus with a seed order, but I don’t really want more chicory plants. The few I have are enough for me, so I will be clipping this as well. So, it seems like my garden trimming work will be rather light this year, but what about my neighbors, with their manicured shrubs and wide expanses of mulch in landscape beds? I guess I will just have to start putting up signs to let them know about all the birds. I will let you know how that goes in the next post. Author priscillahayesPosted on October 31, 2016 November 3, 2016 Categories GardensTags gardeners, gardens, home gardening, planting, Plants, Seeds1 Comment on To Trim or Not to Trim? 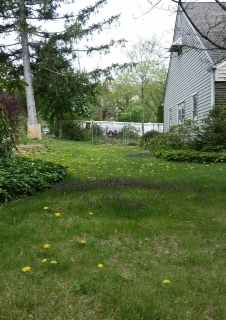 I recently got to catch up with my friend Pam Lewis, who mentioned that she was trying to convince her 80+ year old, “green grass crazy” landlord that the dandelions in the backyard of the apartment shouldn’t be removed. 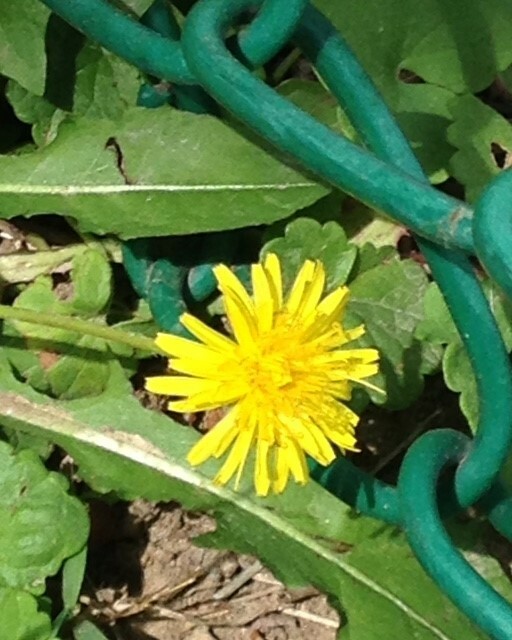 Of course, like many of our weeds, dandelions were introduced by Puritan, Dutch and German settlers, who saw them as a source of both medicine and food—including dandelion wine. So if dandelions are non-native, doesn’t that automatically make them unwelcome? 93 species of insects collect nectar from dandelion flowers, including bees, and butterflies such as sulphers, cabbage whites and admirals. Ruby throated hummingbirds weave dandelion seeds into their nests. Seeds and foliage are eaten by at least 33 species of wildlife including 4 different kinds of sparrows: chipping, field, house and song, American Goldfinch, indigo bunting, quail, turkeys, chipmunks, rabbits and white tail deer. Leaves are eaten by caterpillar larvae of 13 species of butterflies and moths including the Frilliary butterfly, one of the 1st butterflies of spring. Wine and beer can be created with the flowers. Leaves are delicious and highly nutritious as they supply Vitamins A, D, and C, potassium, and magnesium. Dandelion has been found to be helpful for arthritis, has been utilized as a laxative and as a treatment for liver disease. The milky sap is excellent at removing warts, which Pam thought was especially great to know. As you can see, Pam’s research seems to suggest that this non-native plant is extremely beneficial, so how should we respond to dandelions? Should we continue on with knee-jerk removal, or should we learn to understand them as something useful to both humans and other species? As it turns out, there is a project devoted to just such questions based at Columbia University. Called the Introduced Species Summary Project, its goal is “to provide information that would help a natural resources manager or concerned citizen to understand the basic biology of a non-native species and whether and how to respond to its arrival.” (http://www.columbia.edu/itc/cerc/danoff-burg/invasion_bio/inv_spp_summ/invbio_plan_report_home.html) The project grew out of a graduate level Invasion Biology course and a Certificate in Conservation ecology course. I just love discovering things like this and the Lost Ladybug Project. There are 95 species included in the Project so far, most of which are not actually just arriving, but have already “become common in at least some areas of the Eastern United States.” I have noted that there is an entry on both the domestic cat and on humans, both of which I will probably report on in this blog at some future date. But for dandelions, the site confirms what Pam learned—the plant has many benefits, and unlike many introduced species, actually hosts or feeds much beneficial wildlife. The Introduced Species Summary Project found no ecological threats posed by dandelions unless you just insisted on thinking of them as weeds, like Pam’s “green grass crazy” landlord, who she hopes to convince otherwise with her new findings!